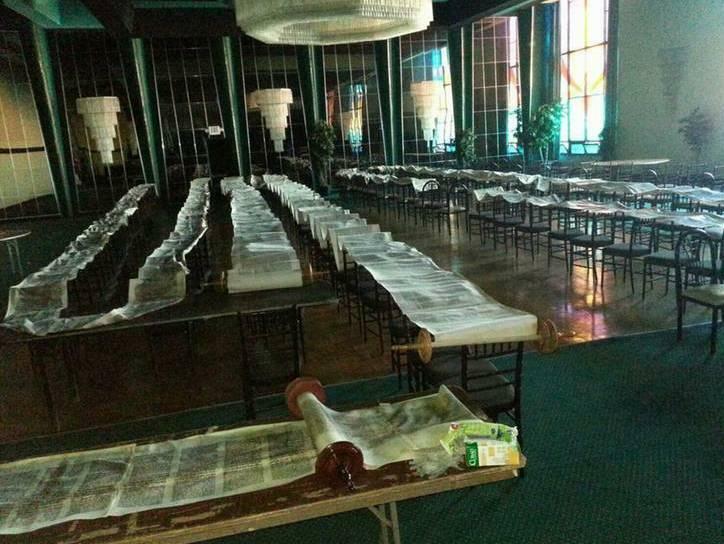 Torahs are draped on chairs and tables at Temple Israel of Long Beach, N.Y. The synagogue was flooded during Superstorm Sandy, but hasn't received federal aid. The sanctuary of Temple Israel of Long Beach, N.Y., was flooded with more than 10 feet of saltwater in some places, says Rabbi David Bauman. "Roughly 5 to 7 feet [of water] in most, and there were surges — particularly in our mechanical room — that went upwards of 12 to 14 feet," he says. It's warm inside the synagogue, but Bauman says this is a recent development. They just got their heat back. The sanctuary is mostly undamaged, but every room downstairs has been gutted. All that is left of the religious school and recreation rooms are concrete floors and wooden beams. One room has rolls and rolls of Torah scrolls, laid out like ribbons over dozens of chairs. The temple lost six Torahs and all the historical records of a 90-year-old synagogue. Bauman says it will cost about $5 million to restore the buildings; the congregation has raised a couple hundred thousand so far. FEMA has told houses of worship to apply for aid. The federal agency has extended the deadline, but the rules are murky. Religious institutions are considered ineligible according to FEMA regulations. But if they run a soup kitchen or a homeless shelter, or if they have community activities that are nonsectarian, they may be considered for federal aid. Barry Lynn, executive director of Americans United for Separation of Church and State, says the federal government should not pay to repair or maintain houses of worship. Nathan Diament disagrees. He's the executive director of public policy for the Orthodox Union's Institute for Public Affairs, which represents nearly 1,000 congregations coast to coast. "Perhaps that's the way Americans United or the ACLU would wish the First Amendment be interpreted, but that's not just the way it's interpreted right now," he says. "If the government is giving out money to nonprofits on a neutral basis, the government does not have to go out of its way to exclude religion or religious institutions from participating in that program." Diament brings up all kinds of exceptions. When churches were damaged after the Oklahoma City bombing, federal aid was initially denied, but Congress enacted special legislation to aid the churches. Something similar took place in 2002, after an earthquake in Seattle. Government money has helped restore the California missions and a historic church in Boston. A federal appeals court said Detroit could aid churches during a restoration of downtown facades before the Super Bowl. Diament's organization is talking to the Obama administration, seeking clarification of FEMA's grant rules. He says that as of Feb. 1 in New York alone, 86 houses of worship have individually registered with FEMA, while 125 Catholic churches are filing together. Not all clergy take Diament's position. Rev. Mark Lukens of the Bethany Congregational Church in East Rockaway argues that preventing the entanglement of religion and government protects religion more than it does government. "When we take money from the government for our houses of worship for purely religious purposes, essentially what we are doing is we are allowing ourselves to be co-opted," he says. It's like in the Gospel of Luke, he adds, when Satan offers Jesus the Kingdom of the World, and Jesus says, "Worship the Lord your God and serve him only." "We're supposed to be a moral voice in the public square," Lukens says, "and if we're receiving funds from the government, then that can neutralize that ability to be a moral voice. You can't bite the hand that feeds you, so to speak." But as Bauman surveys his ravaged synagogue, he says no one is asking the government to buy prayer books or Torahs. "I do think that the backbone of this country has been religious institutions of any kind ... of any flavor," he says. He says he believes the government should not discriminate, but it should base its funding decisions solely on an assessment of the damage sustained in a disaster. But, he adds, if it took three months for Congress to address the entire populace affected by Sandy, how much harder will it be to get money for something like this? The impending blizzard comes as some of the Northeast is still cleaning up after Superstorm Sandy. A couple hundred churches and more than 50 synagogues were damaged in that storm. Most are engaged in private fundraising, but many have also applied for aid from FEMA, even though it is not clear if, given the separation of church and state, federal funds are available to houses of worship. NPR's Margot Adler has that story. MARGOT ADLER, BYLINE: I walk into the sanctuary of Temple Israel of Long Beach, New York with Rabbi David Bauman. RABBI DAVID BAUMAN: We had upwards of 10 feet of saltwater in certain locations, roughly five to seven feet in most. There were surges - particularly in our mechanical room - that went upwards of 12, perhaps 14 feet. ADLER: Inside, Rabbi Bauman tells me they just got their heat back. BAUMAN: So the warmth you're feeling now is brand new, so enjoy. ADLER: The sanctuary is mostly undamaged, but downstairs, room after room of nothing but concrete floors and wooden beams. BAUMAN: ...obviously no longer in existence. ADLER: This has been completely gutted. ADLER: And in another room, rolls and rolls of torah scrolls, laid out like ribbons over dozens of chairs. They lost six torahs, and all the historical records of a 90-year-old synagogue. Rabbi Bauman says it will cost about $5 million to restore the buildings. They've raised a couple hundred thousand so far, but they haven't gotten any federal disaster aid. FEMA has told houses of worship to apply for aid, has extended the deadline, but the rules are a bit murky. Religious institutions are considered ineligible, according to FEMA regulations. But, for example, if they run a soup kitchen, a homeless shelter, have community activities that are non-sectarian, maybe they can be considered for aid. The federal government should not pay to repair or maintain houses of worship, says Barry Lynn, Executive Director of Americans United for the Separation of Church and State. BARRY LYNN: The Supreme Court's drawn a pretty clear line about giving certain kinds of assistance to churches, but not allowing them to be paid to buy brick and mortar to construct or reconstruct their properties. I still think that's good law, and I think it ought to be respected, even after the devastation of Sandy. NATHAN DIAMENT: Perhaps that's the way Americans United or the ACLU would wish the First Amendment be interpreted, but that's just not the way it's interpreted right now. DIAMENT: The government does not have to go out of its way to exclude religion or religious institutions from participating in that program. ADLER: Diament brings up all kind of exceptions. When churches were damaged after the Oklahoma City bombing, federal aid was initially denied, but Congress enacted special legislation to aid the churches. Something similar took place in 2002 after an earthquake in Seattle. Government money has helped restore the California missions and an historic church in Boston. A federal appeals court said the city of Detroit could aid churches during a restoration of downtown facades before the Super Bowl. Diament's organization is talking to the Obama administration, seeking clarification of FEMA's grant rules. Not all clergy take Diament's position. Some argue preventing the entanglement of religion and government protects religion more than it does government. REVEREND MARK LUKENS: When we take money from the government for our houses of worship for purely religious purposes, essentially what we are doing is we are allowing ourselves to be co-opted. ADLER: That's Reverend Mark Lukens of the Bethany Congregational Church in East Rockaway. It's like in the gospel of Luke, he says, when Satan offers Jesus the kingdom of the world, and Jesus says worship the Lord your God and serve him only. LUKENS: We're supposed to be a moral voice in the public square, and if we're receiving funds from the government, then that can neutralize that ability to be a moral voice. You can't bite the hand that feeds you, so to speak. ADLER: But as Rabbi Bauman surveys his ravaged synagogue, he says no one is asking the government to buy prayer books or torahs. BAUMAN: I do think the backbone of this country has been religious institutions of any kind, right, of any flavor. ADLER: And he believes the government should not discriminate, but base its funding decisions solely on an assessment of the damage sustained in a disaster. But, he adds, if it took three months for Congress to address the entire populace affected by Sandy, how much harder will it be to get money for something like this? Margot Adler, NPR News, New York. Transcript provided by NPR, Copyright NPR.